Ships from Hong Kong. This cozy cotton scarf is the perfect cold weather and Fall companion. Using high-quality cotton fabrics, soft and comfortable, thick and warm. And it has a slight elasticity, so that your baby can directly put the scarf into the neck, very easy to use. Bright color dressing up your little baby more cute. 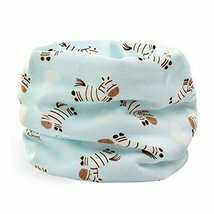 Make your baby become more fashionable,attractive,beautiful,your kids will like it very much.